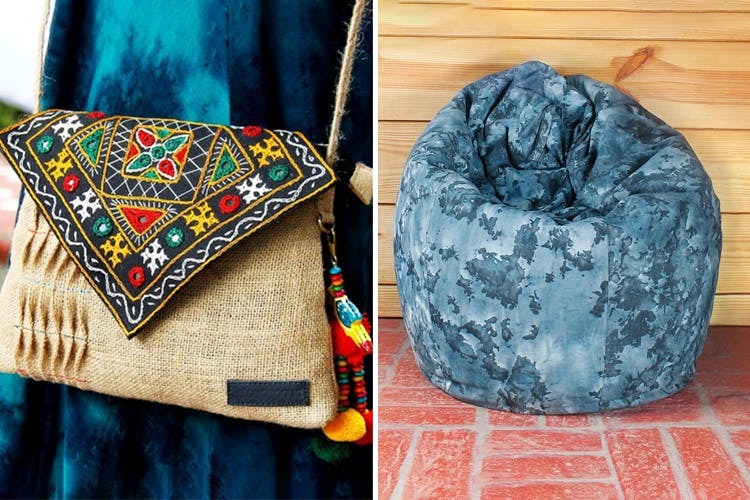 Pulpy Papaya is an Indore-based brand that focuses on bridging the gap between artisans and customers by offering handcrafted goods procured directly from the makers itself. Their website is full of funky products with hippie patterns and prints, all of which we love and wish to “add to cart”. From Afro bamboo masks, hand-painted kettles and trays to djembe and cycle print bed sheets, cushion covers and wooden fridge magnets, Pulpy Papaya stocks everything you’d possibly need to create a cosy haven where you can unwind best after a hard day’s work (Don't miss those funky bean bags!). They’re also selling un-stitched fabrics which are both artsy and ethnic (and get it all delivered to your doorstep). Other than this, they also have hand painted T-shirts and boxers for men and saris, palazzos and tops for women. You’ll also find printed clutches, sling bags, laptop bags and duffel bags where you’re most likely to be spoilt for choice. Also, their cushion covers, journals, perfume diffusers and hoards of other items sold by Pulpy Papaya can be shipped to any part of the world, and they even offer free shipping across India on orders above INR 500. The best part? All of it is pretty affordable. We miss the gorgeous footwear that they used to sell before.